The rumors are true (huh? What rumors? ), I have returned to loading my Muni monthly pass to my Clipper card. I reported in late April I decided to switch from an e-pass to a paper pass because of the technical problems lingering with TransLink (former name of Clipper), including a bad experience on the Cable Cars. The reason why I switched back from a paper pass to an e-pass is because of another unfortunate situation, Commuter Check. They have been mailing me my paper pass for six months, and it went mostly well, except for my November pass. A new policy is if a person wants to have more than one fare media mailed to them, they are mailed in their own envelope. For me, I asked for a paper pass and a voucher for the remaining balance, and they sent me two envelopes. For the November pass period, I got my pass in the mail on the very last day of the previous month, which really made me feel uncomfortable. I switched back to Clipper because I asked Commuter Check to send my funding to my commuter benefits debit card and no fear of a delay in the mail since funds are electronically added 10 days before the new month. Now I have the flexibility to purchase a monthly pass, or move the funds to Clipper e-cash in case I feel I can't make-up the $60 value of the Muni e-pass. 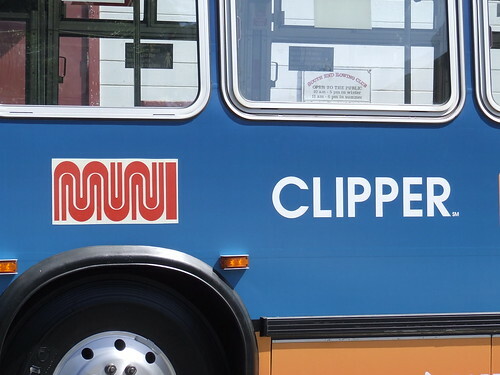 Another reason for the switch, since Muni's "A" pass users switched just a month ago, Muni really had to keep a good eye on the Clipper machinery used on all buses, trains, and metro stations because they knew that a broken system could mean losing thousands of dollars. I've noticed the reliability of Clipper drastically improving and it factored in my decision. It would be nice if Muni installed some more Clipper card/Muni ticketing machines at Powell station's main gates (west gates). They only have three machines and there's always a line of 5-10 deep for each machine. Can BART ticketing machines be ready to add Clipper value sooner? EZ Rider's transition is going to be huge, and there's not many add value locations nearby BART stations (except downtown SF). Can the face of the Clipper card be a little more scratch resistant? Even a small fingernail scratch ruins the shiny card. Lastly... this is my 500th blog post! I can't believe I've lasted this long. One other "clipper thought" to your list perhaps. -- they should make the gates react faster when exiting the station. I hate having to break my stride. Another thought: why do the Clipper-only AVMs require you to insert the card to begin the loading process. I much prefer them using the Muni machines where you only need to tap the card. Raymond: The machines you are talking about are made by different manufacturers. The non-Muni machines are much older.